The trials on the claims against the police by victims of the mass arrests are equally tragicomical. None of the arrested are accused of anything and yet the police want to convince the court that the mass arrest was necessary due to something called “the black bloc”. This imaginery phantom is proven to be dangerous by videos in the court room from other countries showing people making violent acts. To allow such evidence in a court shows that Danish courts not any more respect normal rules for what is relevant for a case or not. When the last case after the Gothenburg riots at the EU summit in 2001 came up in the court in Helsinki an edited Swedish police video of the most severe violence used against the police during the course of events was presented as evidence. The judge commented: -Were are the accused? The two accused activists were charged with the crime of committing violent rioting. The Swedish prosecutor who had handed over the case to the Finnish authorities claimed that at least one year in prison was the only acceptable sentence. Next video showed the accused. This time they were easily identified, one with a yellow ice hockey helmet, the other one with the more common white color. The police had also helped the court by putting easy visible circles around the two accused persons. They were mostly sitting or standing nd talking to each other in the video. At times they went forward and tried to push themselves through the police line without violence. It all ended with police horses eating some grass. This time the judges out another question: – When come the climax? This was followed by interrogation of the police in charge. He was convinced that there were 150 violent activists dressed up in ice hockey gear attacking the police and described how cobble stones were raining down from heaven on the police. On the videos with the accused some 30 activists dressed up as so called white overalls could be seen who were being beaten by the police and no cobble stones at all during the time when the violent acts which the Finnish activists were accused of should have happened. The stones were thrown after a violent attack by the police and not by any people in white overalls. On the question why the courts in Sweden had not accused all the almost 500 people who was claimed to be violent rioters by the police the Swedish policeman answered in a less clever way to a Finnish court. He said that this was not possible as it would cause him to sit in trials until his retirement. In Finland the idea is that if you have committed a crime you should be brought to justice on equal terms as everybody else who have committed the same crime. They also claim that there must be evidence showing that you have committed the crime. The trial ended with a comment by the judge. It was a short tip he said to the accused: – Next time don’t bring a yellow helmet. The whole courtroom burst into laughter. The two accused were sentenced as not guilty to the crime of having participating in violent rioting. Finnish courts are normally very strict on any violent behavior as well as not obeying the police. I am convinced that if the Swedish prosecutor would have charged the Finnish activists fro the crime of not obeying the police they should have been sentenced as being guilty and given a fine of the normal sort for this in Finland. The mistake was to charge them for a crime that were committed by others and not them. In Sweden an white overall activist accused fo exactly the same thing as the Finnish activists was brought to jail for three months. The Swedish courts after Gothenburg brought injustice to the Nordic countries and turned the courts into political theater. The Danish courts now have the chance to bring some respect for Nordic courts back to democratic and juridical order again. So far the trials has been so tragicomical and the part representing the police used so irrelevant evidence that one wonders if there is no respect for juridical principles in Denmark anymore. Either the evidence should be rejected as not having with the case to do as videos from other countries or should be commented upon as useless as in Finland. 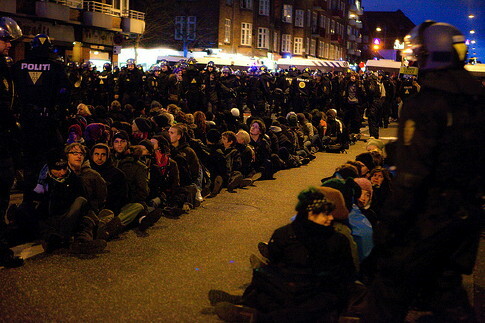 The Danish police have created a hysterical atmosphere by misleading mass media claiming that 5000 to 10000 violent activists should turn up in Copenhagen. When this false rumor never materialized they now try to claim that it anyway was correct by counting black dots on air photos. They claim that they have found 1 250 black such dots close to were the mass arrests took place, thus providing what they see as evidence that there was a necessity to mass arrest 918 persons to stop the black dots from destroying the city. Earlier in the same trials they had claimed that the black bloc only were some 200 to 400 people, people that was guided by the police away from their plan to go to a protest in the city center against a climate business event and instead into the main demonstration. This was followed by some minor smashing of windows at the stock exchange and the foreign ministry without the police interfering against those who committed the acts then or later. The mass arrest took place in another section of the demonstration in another district of the town 40 minutes later than the smashing of many windows. In this section there were also people dressed in black as the syndicalist youth in Sweden, who had permit to go in the demonstration and fully accepted the rules set by the demonstration organizers. Together with members of Attac, environmentalists, Hare Krishna and others. In the paranoid world of the Danish police any black dressed person is a potential member of the collective force of 5000 to 10000 violent activists they claimed should come to Copenhagen. It is now becoming more and more clear that the symbiosis between politicians, media and the police have turned the courts into political theater. The summits produce more and more photo sessions for the media and less and less results. To give some importance to these photo opportunities for the press the politicians constantly widen the right to use almost any means for the police, make anything a crime and puts enormous resources into ever growing intelligence units competing with each other. These intelligence units more rightly called units for distributing fantastic somewhat too creative false rumors causing complete disorder in proportionate basis for decisions are the tool for producing an atmosphere of importance surrounding the photo session. After all must something important happen when so much security is need against such enormous threats outside consisting of countless of violent, and as we shall see always Italian phantoms. The peace and conflict researcher Hans Abrahamsson have shown how half a dousin different US intelligence units during the EU Summit in Gothenburg together with their Swedish equivalents were able to compete with each other and plant a rumor that 400 Italian white overall activists would push themselves into the hotel of president Bush. This paranoid idea was not taken serious by the Swedish security police which one could see as the appropriate authority for assessing threats of this magnitude and balancing the national security interests of Sweden and the US. Instead the head of the police operation that had been educated several times in the US decided against the will of the security police. They were well informed by many of their security agents inside the school were the white overalls were supposed to prepare for the attack against Bush. The whole thing ended by the police storming the school with almost 500 people inside including the 30 or so white overalls who mainly were Finnish and some brought to trial in Helsinki. The intelligence services and the police in Sweden as well as Denmark have been turned into mad houses producing false rumors with the politicians as the main driving force behind the media circus. It is about time to wake up and see that the emperor is naked. The ever growing misuse of both the police and the courts for political Summit theater purposes have reached a tragicomical climax in Copenhagen. There is no way that the juridical system can regain any defensible rational core without rejecting the claims made by the police in both the trials on the mass arrests and against the spokes persons for non-violent civil disobedience. Concerned citizens and Danish representative organizations must stand up for defensible juridical principles and protect democratic rights That is the only way to calim that they can have respect when inviting people from the rest of the world to come and use freedom of expression at a summit.